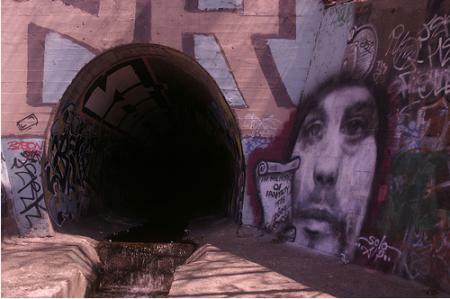 When I got home from work today, I was on the phone with my friend Jeremy, talking about the explorer & kindred spirit who died Sunday morning (while exploring this tunnel, as featured on my Action Squad website). I didn’t know Ian in life, but feel like I’ve come to know him through his writings and photos, and have been surprisingly moved by his untimely death. >>This Urban Explorer/Photographer was in a drainage tunnel on East River Rd just south of the Marshall Av Bridge when a sudden downpour swept them out of the tunnel into the river. Friend survived, he did not. His main interest was photographing graffiti. He was assembling his photos for his first gallery showing. Bad luck. About an hour later, I was composing a facebook message to the author of the ‘Science & Synchronicity‘ article I linked to from here earlier today, who it seems is a kindred spirit as well. I was writing about the role of entheogens in mystical experiences, how synchronicities often seemed to happen in co-incidence with marijuana, and how it is difficult to be open about these things and be taken seriously, when my phone rang. 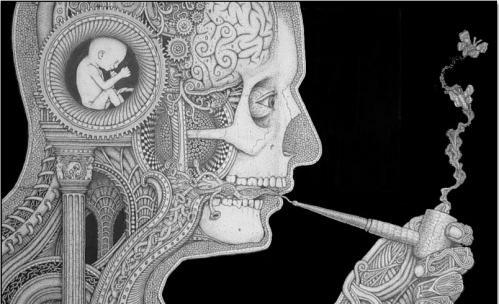 Psychedelics may be what really launched me off with full-blown mystical experiences, but marijuana has really helped me experience some semblance of a blended way of being – between a mystical state of consciousness and a more ordinary and utilitarian (to living as I know it) way of being. I am trying to pull myself into a more mystical awareness, I think – without going clear off the edge into the abyss. Like you, I hesitate to publicly discuss the “drug” angle much. He’d pulled over in a rest stop in Iowa and was trying to smoke some pot in his car when a car pulled up next to him, driven by a white-haired old man looking very religious and conservative and Iowan – making Mark paranoid. But then after using the bathroom, the old guy gets back in his car, looks around furtively – and starts puffing on a pot pipe. I immediately thought of you when I learned about Ian’s death. I was very glad to hear you were still ok!